We’ve already rounded up our favorite Triumph Scramblers and Thruxtons, but today we’re tackling the base model in Triumph’s modern classics line—the Bonneville. 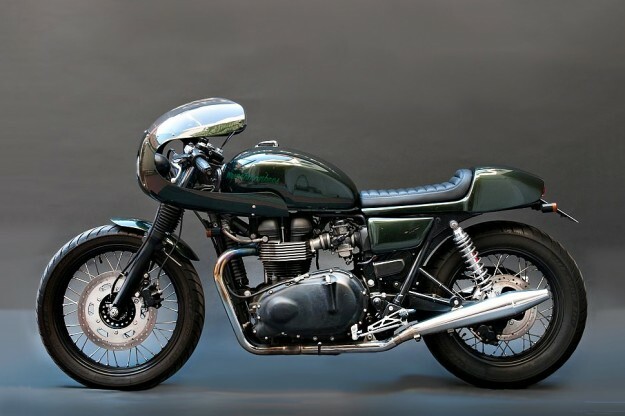 Styled after the Bonnies of the 60s and 70s, the ‘new’ Bonneville was released in 2001 and went on to form the basis for the Scrambler and Thruxton. It’s been available in a few designations over the years, including the standard, SE and T100 models, the main differences being trimmings and, in some cases, wheels. While it might not look as dressed-up as the Scrambler or the Thruxton, the stock Triumph Bonneville invokes more than enough nostalgia. It’s just as popular among riders and builders alike. As usual, that makes the task of selecting our favorite five almost impossible. Mule Motorcycles Some would call Richard Pollock outspoken; others might say he’s opinionated. Either way, there’s no doubt that he’s one of the most experienced and knowledgeable builders around. (Just check his guide to building a cafe racer.) 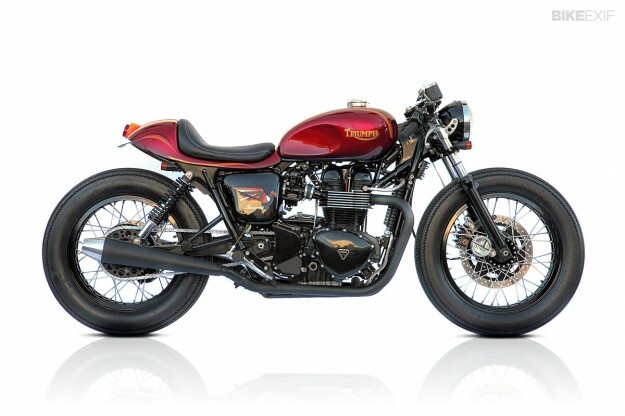 If you have a Hinckley Bonneville in need of customization, you’ll be in good hands. 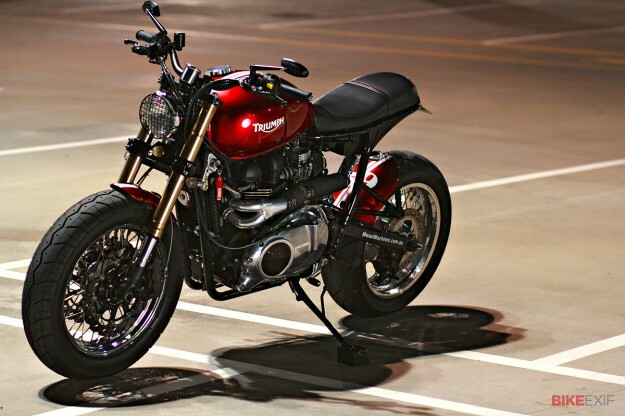 This particular Bonnie is loaded with significant performance upgrades. For starters, the engine was sent to Triumph Performance USA and bored out to 904cc and fitted with new cams, 39mm Keihin FCR flat-slide carbs and a remapped ignition module. That, and the 2-into-1 Mule exhaust system, resulted in a healthy 85bhp at the rear wheel. Handling is taken care of by upside-down forks from a Yamaha YZF-R6 and Race Tech rear shocks, built to Mule’s specifications, with 19” Sun wheels wrapped in flat-track rubber. Bolt-on Mule frame downtubes hold the new Earl’s competition oil-cooler. The fiberglass tail unit is also a Mule catalogue part—fitting it requires shortening the subframe by about six inches, and it’s supplied with an end-cap assembly that’s welded in place and houses the tail light and license plate bracket. Mr Martini ‘Shorty’ We’ve featured Nicola Martini’s work in all three of our Triumph modern classics Top 5s—and with over two decades’ experience working with the marque, that’s not surprising. 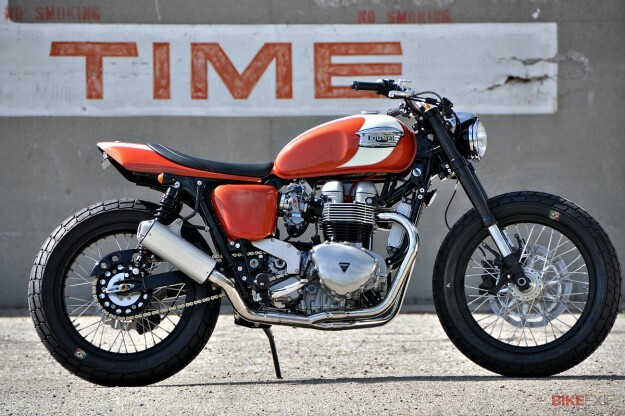 This is ‘Shorty,’ a bare bones 2006 Bonneville with clear dirt-track influences. Deus ‘Dave’s Bonney’/Cherry Red Deus are know for designing motorcycles with clean lines and gorgeous paint—but this one’s particularly stunning, even by the Sydney company’s standards. A fair amount of work’s gone into it: It’s been lowered two inches, the swingarm extended and the subframe shortened and modified. Wrenchmonkees T100 It’s not often that you see a fairing on a Bonny, but the Wrenchmonkees have pulled it off superbly. It’s a T100 built in 2011 for the opening of Italian motorcycle and lifestyle store, Hook Motors. It’s quite a looker and could quite easily be mistaken for a vintage race bike, thanks to that fairing and the café-style Wrenchmonkees tail unit. MeanMachines ‘Mad Max’ Australian builder Wenley Ng said that his aim with this 2008-model Bonnie was to “build a monster truck tracker.” I’d say he succeeded. ‘Mad Max,’ as Wenley’s dubbed it, owes most of its prowess to its huge tires—130-section at the front, and 200 at the rear. Accommodating those are upside down forks from a Suzuki GSX-R, mounted in custom triple trees, and a widened and extended swingarm with a mono-shock conversion. The subframe’s been shortened to match the perforated leather seat, and the tank raised slightly at the rear to further alter the bike’s stance. There’s a host of other mods, including the expertly crafted 2-into-1-into-2 exhaust system, and the engine’s received pod filters, a re-jet and a dyno tune. Photo by Cam Elkins of Stories of Bike. Honorable mentions must go out to Cafe Racer Dreams, Dime City Cycles, Ton-Up Garage and British Customs—all of whom have put out great examples that narrowly missed our final list. 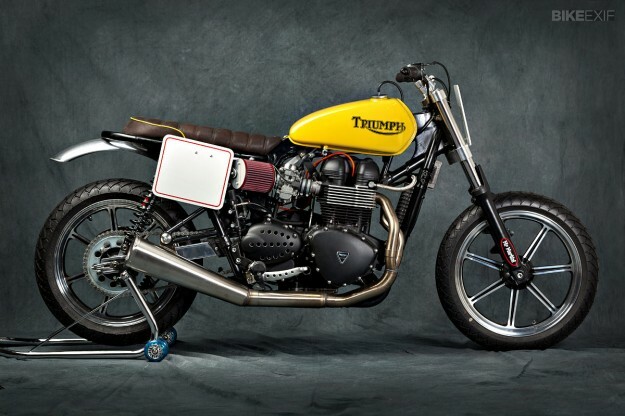 If you think there’s another Triumph Bonneville custom that should belong here, let us know in the comments. 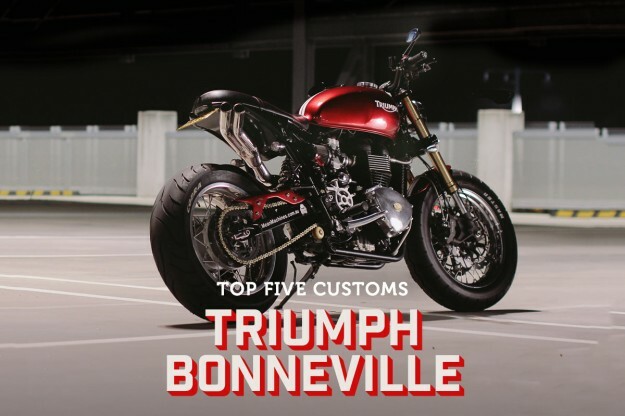 Our previous Top 5 covered the Honda CB750.